In an earlier post , I shared an outline of the broad themes we are tackling in this pilot study phase of our learning community. In this post I would like to share some specific examples of student work. First, here are the instructions we gave students for the second prompt. Jessica Fei, a HGSE doctoral student who is particularly interested in the ways in which young people think about their neighborhoods, helped to craft this prompt. By walking around the world, Paul is trying to get a deeper understanding of our world than our fast pace of life normally allows. One thing he is trying to understand is how human beings connect to place. He is also interested in local people’s understanding of where they live. 1. Read several of Paul’s “dispatches” from the National Geographic website: http://outofedenwalk.nationalgeographic.com. Read them and pay special attention to how Paul writes about place and local people’s understanding of where they live. 2. Imagine that a good friend is visiting you for the first time. He or she has just arrived. Please sketch a map to show him or her what you consider to be your neighborhood – as you see it through your eyes. This map does not have to be “accurate” or similar to other maps that exist. 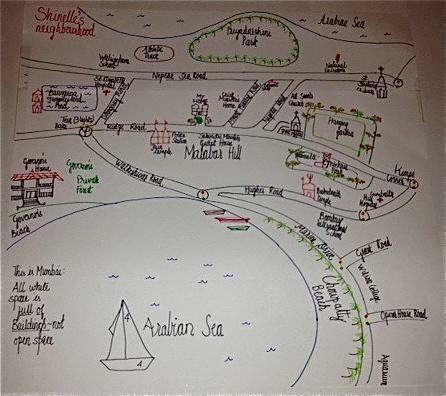 You can draw this map on paper and then scan it or photograph it to upload into Edmodo. Alternatively, you can draw it electronically—for example through Doodle Art or Paintbox. You can also add a written explanation of your map if you think it would be helpful. Also think about what you would count as your neighborhood or community. If there are important places for you that lie outside your neighborhood, you can include them in your map. However, draw a boundary around your neighborhood to show what lies inside and outside your neighborhood. Scroll to the bottom of this post to view a gallery of selected neighborhood maps. Meanwhile, here is one example of a student’s posting of a map on Edmodo, her accompanying commentary and subsequent interaction with other students within the learning community. Please note that to protect their privacy, students do not use their real names within the Edmodo space. i live in an old stone house, on a tree-lined street calledRidge Road, in a neigbourhood called Malabar Hill. Malabar Hill was a thickly forested area that overlooked the Arabian Sea, with homes that sat on either side on the ridge of that hill. Sadly, aside from protected parks and private lands, every inch of our city is being constructed upon. The prices of real estate in this part of the city are the highest because it is so close to the central Fort area and the Nariman Point business area. i have drawn a map showing you parks which still have specimens of stunning old Rain trees, Brownea, Amherstia, Barringtonia, Bauhinia, Gulmohar and other flowering trees. We are also surrounded by temples and churches and the Arabian Sea in the East and West. When India was a British Colony, most of the British officers lived on this hill and drove down to their Fort in their carriages. Today we are confronted with three lanes of traffic each way on Marine Drive and bumper to bumper traffic -taxis, motorcycles, buses, cars, ALL racing to get ahead at the same time. My drive to school is down Malabar Hill on Walkeshwar Road on to the beautiful Marine Drive. I love watching people, the playful dogs on the promenade and if there is no smog – the most uplifting sunrises. I have so much to share about my neighbourhood and city – it is like no other. it is teeming with everything – people, cars, pollution yet an energy that is very special! CANADA18Gus T. – Wow! Your neighbourhood is certainly unique! I would love to live in a neighbourhood overlooking a sea. AUSTRALIADan S. – How long does it take you to get to school? It would be nice to be so close to the sea and be close to a lot of parks. INDIA9Shinelle G. – Hi Dan, i’m sorry it took me a while to reply 🙂 It takes me 10 minutes to drive to school in the morning at 7.20am and 20-25minutes to get home. The congestion on the road starts once you leave the Marine Drive and go into the Fort where the office buildings and our school is. Some day, we will post those pictures and descriptions for you too. i love it all though 🙂 Marine Drive is always a sight for sore eyes – it is always delightful to be able to see nothing but space as you look out of the car/bus window – no buildings – just a horizon and a clear sea if you are lucky. Yes, it is nice to be close to so many parks and the sea. Yet the parks and the beach are very overcrowded…. on a Sunday, there must be families every twenty feet on the lawns. But we are still lucky because newer parts of the city are not so well planned and dont have many gardens! INDIA9Shinelle G. – Hi Gus, Thank you for the compliment about my neighbourhood. i am very proud about my city and my neighbourhood but i think it may sound and look prettier than it actually is. Canada is stunningly beautiful – especially the Rockies and the Great Lakes and your Beautiful Forests and the PAcific Coast. Which part of Canada do you live in? Ridge Road, used to overlook the sea. Now the tall buildings that line either side of the road and are built down the slopes of Malabar Hill, don’t allow you to even catch a tiny glimpse of the Arabian Sea from the Road. My great grandmother used to have tea in her neighbour’s garden and watch the fishing boats on the Arabian Sea. Our neighbour is now a 15 floor building and their neighbour below the ridge, is a 5 floor building. But we still get a wonderful sea breeze and plenty of fresh air. Please tell me more about Canada. i hear it that all of it is so beautiful…. So amazing to see how this is inspiring educators, worldwide. Thank you, Paul.